We had so much fun celebrating 5 birthdays with a lake party! If anyone has any children’s clothes that they would like to donate to “Love the Little Ones” that would be amazing. You can bring boys and/or girl clothing of any size to 48 Manor Ave. SW Concord, NC 28025. We are having a clothing drive. If I can get them by Friday, September 23, that would be perfect. If not, we’ll accept clothing donations anytime. It’s tax-deductible. We give receipts. Thank you and God bless! We’re celebrating 5 birthdays Saturday, July 9th, with a fun day at Lake Norman. The precious kids at the children’s home love tubing, swimming, boating, playing, laughing, gifts, cakes, all kinds of goodies, & LOVE. Thank you so much to Oz, Christina, Yoga One, Y2 Yoga, their friends (now our friends), & all of our supporters! Oz, Yoga One, & Y2 Yoga helped us create an incredible day celebrating birthdays with the healing energy, power of yoga, & LOVE! Birthday party & yoga fun! We had so much fun celebrating birthdays with Oz & his yoga team! LTLO is so grateful Oz Idilbi & his team at Y2 Yoga in Charlotte. He will lead us in yoga at The Church of God Children’s Home at 5pm, Sunday April 3rd. We will celebrate 5 birthdays after yoga. Oz & his team purchased all of the gifts & planned the party. This is a message from Oz: Thank you to all the beautiful souls who purchased a gift for the Orphan children. This is going to mean so much to them! ❤ ❤ ❤ Gifts will be delivered tomorrow. Pictures will be shared so you can see the smiles and happiness your support will create! The Yoga Community in Charlotte is changing lives on and off the mat! I’m so proud to be a part of the yoga community in Charlotte. We have birthdays to celebrate at the children’s home Sunday April 3rd. We appreciate your support with gifts & donations in honor of Jennifer & Jaime’s mother who battled ovarian cancer. Sandra’s soul is soaring, happy, & free now. This photo is when our Mom was so happy when her grandson, Jace, scored his 1st touchdown. Her other grandson, Noah, is so funny with that face! Jennifer & Jaime’s precious Mom, Noah & Jace’s adoring Grandmom, transitioned to the Heavenly realm on March 26th. She went through a tragic 4 year brutal battle with ovarian cancer. We know her spirit is happy & free. In lieu of flowers, our Mom would be honored to have donations for Love The Little Ones to help children. You may donate on the website using PayPal. The memorial is Wednesday March 30 at 2pm, Rocky River Church, 7940 Rocky River Road, Concord, NC 28025. We appreciate your love & prayers. 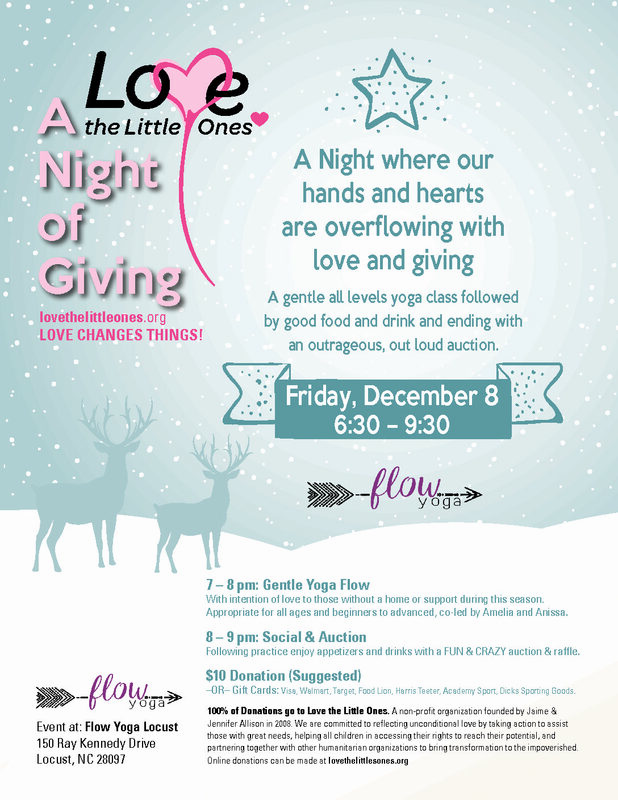 Love the Little Ones is a non-profit organization founded by Jaime & Jennifer Allison in 2008. We are committed to reflecting unconditional love by taking action to assist those with great needs, helping all children in accessing their rights to reach their potential, and partnering together with other humanitarian organizations to bring transformation to the impoverished. Our philosophy is LOVE CHANGES THINGS! LTLO is Investing in Youth Sports! Concord Comets AAU is my sister’s basketball organization. She has a 6th girls team, 3rd through high school boys teams. Jaime coaches the girls this year. It’s the first year having girls! This fundraiser is today, June 16th, 5pm-9pm at Foster’s Grill. All you have to do is eat.